Our postmaster gets big props today. 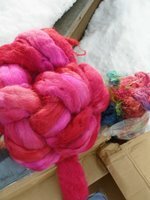 S he drove through snow and an inch of ice packed solid on our back country roads in order to deliver my Yarn Aboard box ! Yipppeeee..
despite the box having seen better days, everything inside arrived in tact! Jackie sent such a lovely assortment of goodies - and she gave incredible attention to detail. 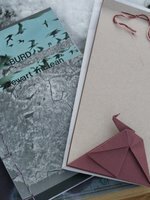 It began with a lovely note card and part of a book that she copied for me called Burd that was written by Stewart Mclean. Apparently, there is a reference in the book to "Cosmic Mother Fu...." that is quite hilarious, since our business is often referred to as CMF - Jackie has translated that now to "Cosmic Mother Fibre".. cute eh?! Even her note to me was a work of art - notice the hand sewn top and the perfect paper crane at the bottom. just lovely. 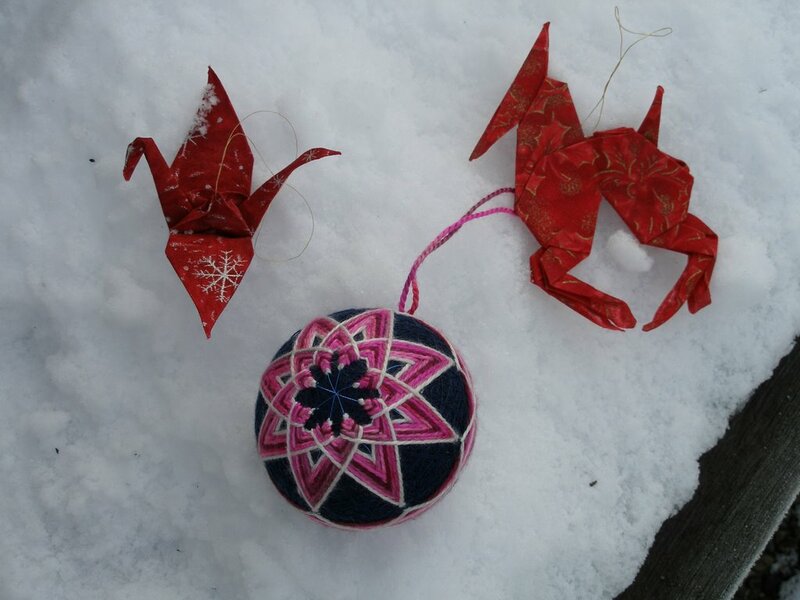 And just look at these hand made ornaments -the ball is handmade by Jackie - it is called temari. She made it with some left over yarns from silk scarves that she wove. I wonder how she knew that my husband and I love stars! (particularly the 8 pointed ones for me) It is almost too incredible to even photograph. And the origami ornaments are also so dear; a horse and a crane. Truly they will be good luck on our tree. She also included a "lobster pen" - it's one of those eewwie-goowie rubbery things.. made me laugh. She said "what's a box from the maritimes without a lobster" tee hee. Okay - now for the fiber.............. tah dah! 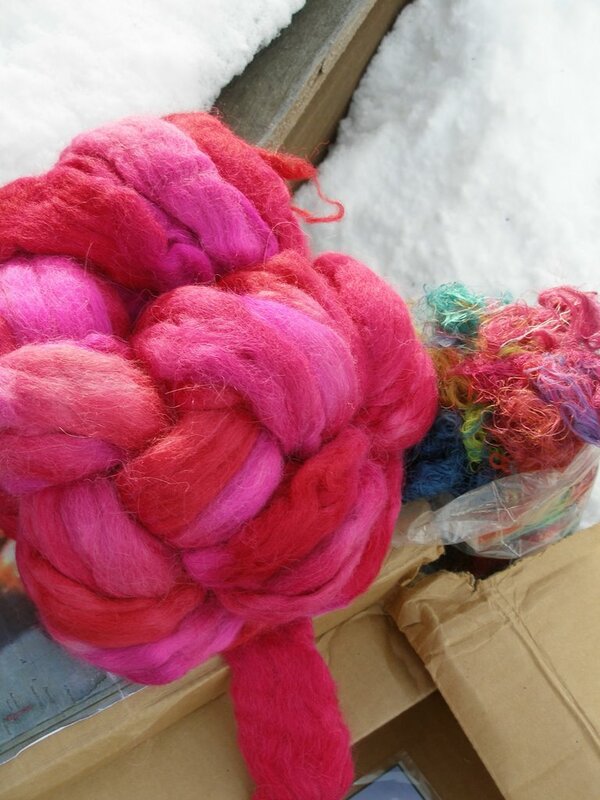 Luscious pink and fuschia alpaca roving (8 whole ounces!). I can't wait until my bobbins are empty so that I may spin that into a yarn for a scarf, or maybe even a shawl if I can make it thin enough. I haven't spun much alpaca, so I am totally in awe of this gift.. can't wait. Isn't the color vivid and wonderful?! It is totally me. Beside the alpaca in the photo is a bag smashed full of silk rags. I have played with these a tiny bit before - flicking them into a dark yarn as I spin. Now I have a whole humongo bunch that I can mess with. wow. they are really fun guys. thank you, Jackie. Your attention to detail, the care in fiber selection and your handmade goodies have made my heart sing. Please hop on over to her blog and give her a big round of applause for this wonderful gift to me! Oh my goodness Teyani the contents of that box are amazing! Everything is so special and wonderful. But the Quivet oh my! You know I just recently bought the book "Artic Lace" and it has all kinds of patterns made with that stuff! If you want to borrow the book just yell! 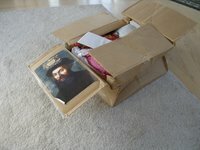 I'm glad that everything arrived safely through the storm (!) and that you are happy with it all. 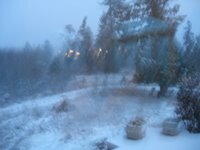 We had a light sprinkle of snow here, but nothing like what we could see in your pictures. Have fun! I am looking forward to seeing how you use the silk fibres. 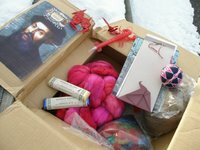 Oh, wow, I was impressed with the box even BEFORE I got to the Qiviut. Wowzer! And, it sounds like your mail-carrier is as good as ours is. Priceless! That's a pretty incredible package! Hope you are staying warm in the snowy weather. What a fabulous package! Temari balls is something I've been anxious to learn to make but haven't attempted just yet. Gold star for your postal person! Very cool package. Looking forward to seeing how the qiviut spins up. That's an amazing package! and brrrr. It looks awfully cold there. What a great box of goodies! I love the ornaments. I know winter storms are annoying and inconvenient, but there is nothing like hunkering down in a warm spot and spinning or knitting. 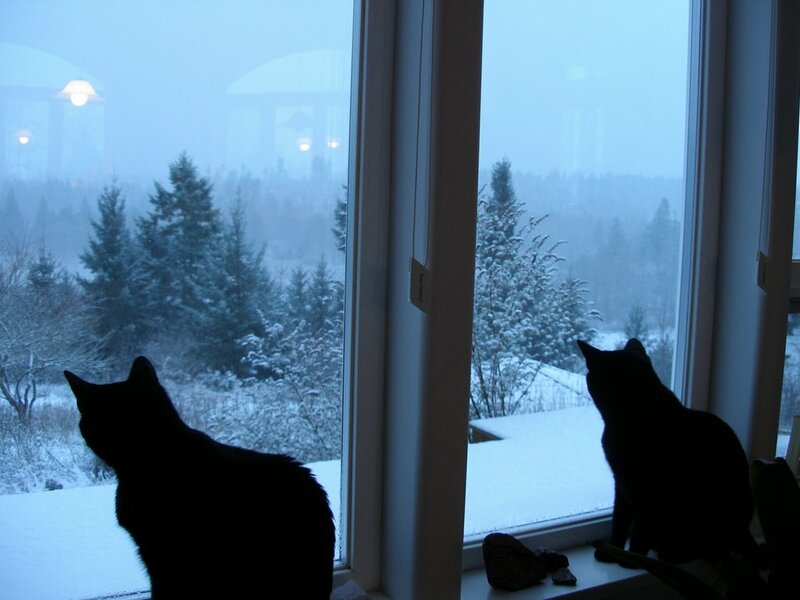 Those kitties would change their minds fast once they were out in it. How wonderful! Jackie was the pal I sent to so it's fun to see that she was had your name! Very, very nice box of good things. Enjoy! and really, the entire box is wonderful, the color of the alpaca so cheerful! jackie knocked it outa the ballpark for you -- don't you love her wicked sense of humor? enjoy the goodies my friend - you deserve all that goodness and more! What a great gift to curl up with on a freezing blustery day! Fiber!! No snow here in Massachusetts yet, but we are forecast to get some on Monday. I'm waiting for winter to break out the sweaters! That's a pretty cool box of goodies! 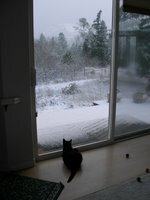 I love the picture of your cat in the window. Wow...what a wonderful box of treats you received! The ornaments are so very pretty and the fiber is amazing! Enjoy it all sweet lady and stay safe and warm in that nasty weather you are having! Wow! What a terrific pal. 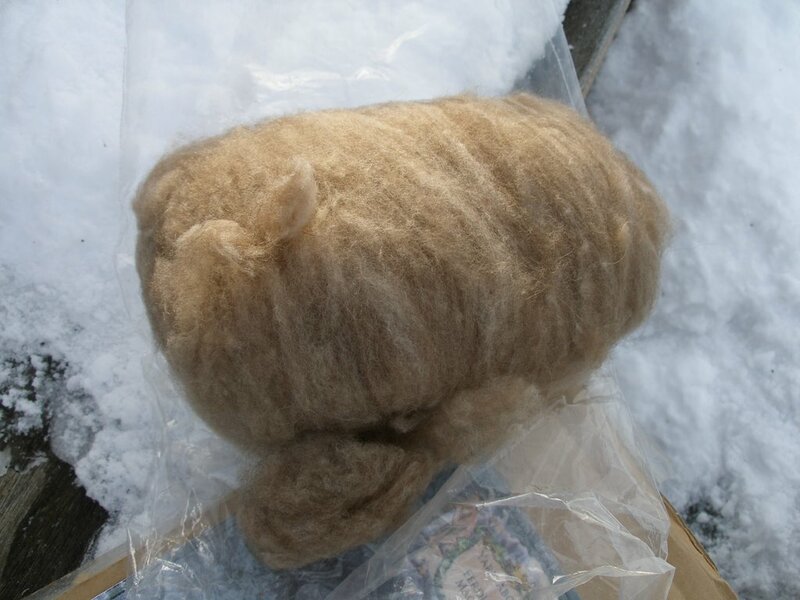 The alpaca is such a lovely color. And I can't believe she *made* the ornaments! Stay as warm and as dry as you can! How very thoughtful of your postal worker to bring you lots of things to do while you're snowbound! 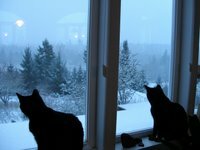 The cats in the window are sweet - if they knew snow was made of water, they might not be so anxious to go outside. What a wonderful treasure box full of good cheer. I'm totally blown away by the temari ormaments. Hope you're staying warm, safe and secure on your mountaintop. This weather is baffling. HOLY MOLY!!! You got the motherload girl!!! Everything in there is just fantastic - I love the ornaments!!! Wow, Jackie put together a wonderful package of goodies for you!! We've only had a bit of intermittent snow so far, none of which has stayed. May chittered at it as it fell - should I tell her it isn't lots of birds? !